Last spring the National Gallery (London) hosted a small exhibition of 12 paintings that have never been seen before in the United Kingdom. 'An American Experiment: George Bellows and the Ashcan Painters' introduces visitors to Bellows and his artist friends (William Glackens, George Luks, John Sloan and their teacher Robert Henri), and to an important moment in the history of American painting. (John Sloan, 1907, 'Sixth Avenue and Thirtieth Street', Philadelphia Museum of Art). The most prominent member of the group was George Bellows. Usually discussed as an artist of the city, often depicting urban parks, Bellows also enjoyed painting landscapes away from the metropolis. The American master of snow, Bellows seems to offer engagement with the natural world as the main subject of his paintings ('The Palisades', 1909, Daniel J. Terra Collection, Chicago). 'An American Experiment' contains seven paintings by Bellows; four of these are scenes of New York State. 'Blue Snow, The Battery' (1910, Columbus Museum of Art) depicts the 25-acre public park immediately adjacent to Wall Street at the tip of Lower Manhattan. The bustling Port of New York and New Jersey lies nearby but little of it is evident. Rather, the city is shrouded in snow and it seems as if sounds are muted. 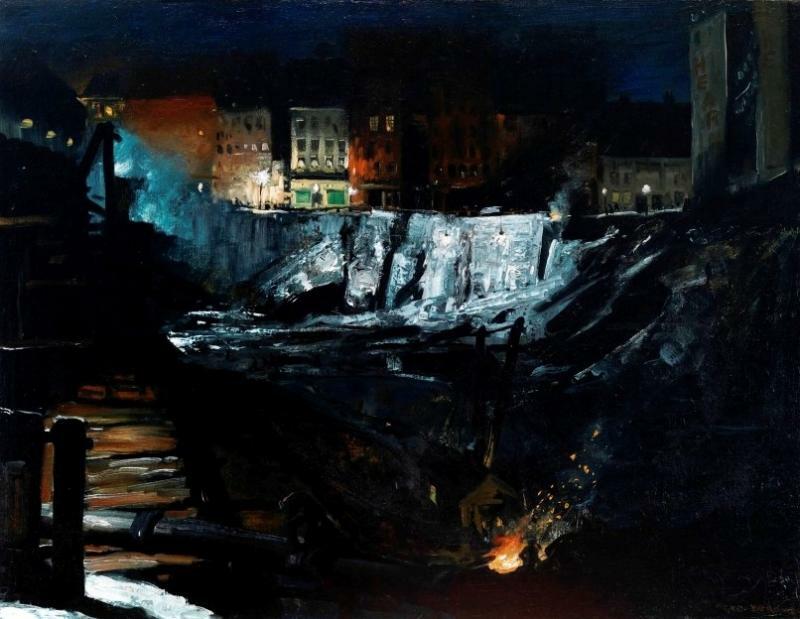 'Excavation at Night' (1908, Crystal Bridges Museum of American Art, Arkansas) is one of a series of images Bellows made of the building work at the site of Pennsylvania Station. This picture has a long art-historical lineage behind it, recalling the paintings of light-in-darkness by the 18th-century artist Joseph Wright ‘of Derby’. Bellows’s early 20th-century version capitalises on the compositional and aesthetic means developed by the artists of the sublime, like Wright and Turner, to describe the urban scene. In the 1910s Bellows increasingly embraced non-urban subject matter, and he spent considerable time on Monhegan Island off the coast of Maine. Here he painted one of his most audacious images, 'The Big Dory' (1913, New Britain Museum of American Art), which anticipates the stylisations of Art Deco a generation later, and reflects the radical avant-garde European influences the artist had recently been absorbing.